"Rightsizing" into your retirement – Bishop’s Move and McCarthy and Stone’s flourishing partnership. A partnership between the UK’s largest family owned removals company and the UK’s leading developer and manager of retirement communities is ensuring the over 60s are reaping the rewards thanks to a much-enhanced customer service. Bishop’s Move and McCarthy & Stone have combined to launch a nationwide initiative which sees the former provide the retirement builder and its customers with removals support as its single quality supplier in this area. 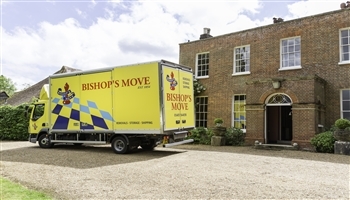 With their nationwide network of branches throughout the UK, Bishop’s Move is now the dedicated removals company for McCarthy & Stone customers in England and Wales, helping residents settle into their new homes and providing essential support during a potential stressful time. Their exclusive ‘Bishop’s Move Concierge’ service offers tailored options to include a de-clutter service, packing and unpacking prior to and following the relocation, change of address support, a pre-home visit with an individual move plan and of course, the transportation of the customers’ belongings to their new residency. Over the past 40 years, McCarthy & Stone has built and sold more than 56,000 properties across more than 1,200 retirement developments since 1977 and is renowned for its focus on the needs of those in later life. This focus on the customer is reflected in the ethos of Bishop’s Move, which has prided itself on putting the customer first since 1854. McCarthy & Stone customers will now themselves benefit from this service which has been refined through six generations of Bishops up and down the UK. In addition, Bishop’s Move is continuing its support to good causes via its nationwide decluttering service. The company has already provided national charity, Sense, which supports people with disabilities, with over £44,000 worth of unwanted items from relocating McCarthy & Stone customers across the UK.